Absolutely! Carrots for dogs offer many health benefits when added to the dog’s daily meals. How much of the health benefits a dog can reap from eating carrots depends on the carrots you choose to feed – because not all carrots are equal! Colorful vegetables indicate nutrient density. By adding a colorful vegetable like carrots to your dogs’ diets, you are providing your pet with a concentrated source of vitamins, minerals, antioxidants, phytonutrients and fiber to nourish their bodies in an amazing way that cannot be replicated with any synthetic vitamins. How fresh are the carrots I am buying? Like all root vegetables, carrots start loosing their valuable nutrients as soon as they come out of the ground at harvest. Therefore, the carrots you buy at the grocery store may be less nutritious than you think, depending on were they were grown, when they were harvested, how long they spent in transportation, and how long they have been sitting under the light in the produce department. Light, air and moisture diminish the nutrient content. 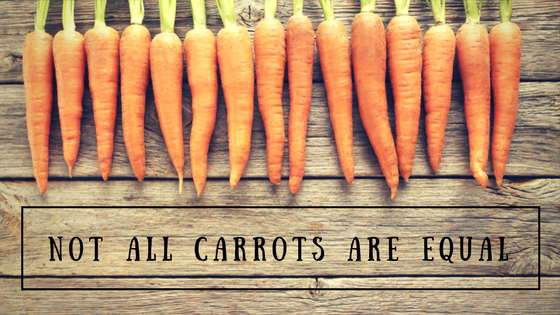 When selecting carrots, they should be firm, relatively straight and bright in color. Limp and rubbery carrots should be avoided as these are indications that they are past their prime. The brightness of the orange color reflects the amount of nutrients present. If the greens are still attached, they should be brightly colored, feathery, and not wilted. When the greens have been removed, check the top of the carrots for dark coloration, an indication that they are no longer fresh. Be aware of baby carrots because they are not actually “baby” carrots at all but rather are less-than-perfect carrots that have been shaved down to a smaller size. Not only are baby carrots more expensive than whole carrots, they’re also typically given a chlorine bath to prolong shelf life. Why does it matter where the carrots are grown? It does matter where the carrots were grown because that is an indicator how nutritious the vegetable is. Growing nutrient-dense foods may be a thing of the past because there is much evidence that our soils are depleted of nutrients as a result of modern industrial farming. The minerals and phytonutrients historically derived from rich and fertile soil are diminishing in our vegetables. Not only is the same farmland constantly re-cultivated without replenishing phytonutrients which yields nutrient deficient crops, but much effort has been put towards breeding new varieties of crops that provide greater yield, pesticide resistance and climate adaption to grow crops bigger and more rapidly. However, the ability to uptake nutrients has not kept pace with that rapid growth. Much of what is being grown in this day and age is quantity at the expense of quality. The Organic Consumers Association cites several studies with findings of diminishing nutrients: An analysis done by Kushi Institute of nutrient data from 1975 to 1997 found that the average calcium levels in 12 fresh vegetables dropped 27 percent; iron levels 37 percent; vitamin A levels 21 percent, and vitamin C levels 30 percent. Another study of British nutrient data from 1930 to 1980, published in the British Food Journal found that in 20 vegetables the average calcium content had declined 19 percent; iron 22 percent; and potassium 14 percent. Yet another study concluded that one would have to eat eight oranges today to derive the same amount of Vitamin A as our grandparents would have gotten from one. Many experts believe the depletion of nutrients in our soil is responsible for many of the degenerative diseases that are more prevalent now than they were in our ancestors. Yes, our ancestors had a shorter lifespan, but their primary cause of death was infection or injury, not degenerative diseases. Northern Germany is one of the places that still has extremely rich and fertile soil and better farming practices that include alternating fields between growing seasons to give land time to restore, and the use of pesticides and fertilizers its much more controlled. We pride ourselves to import Olewo Dehydrated Carrots for Dogs from Germany. The product is made from 100% fresh, non-GMO carrots without additives and preserved naturally through dehydration. These carrots are much more nutritious because of where they were grown, and at Olewo the carrots go directly to preparation after harvest to avoid nutrient loss. When Olewo Carrots are rehydrated in warm water and added to your dog’s daily meals, they have fresh food appearance with a nutritional value that closely resembles the fresh carrots they were made of. Therefore, Olewo Carrots are very effective and pet owners are actually able to see a difference in the health of their dog, often after feeding the product for just a short amount of time. 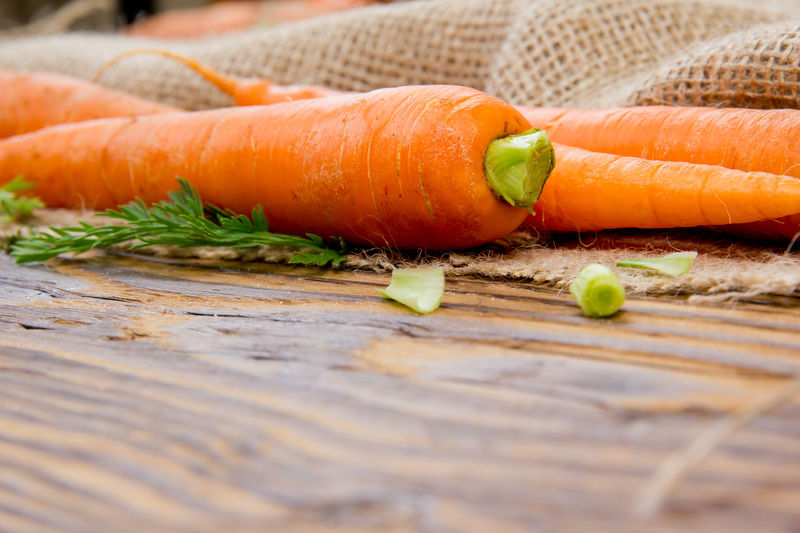 Olewo Carrots are prepared to be easily digested by dogs so they can assimilate, absorb and utilize the amazing nutrition in carrots to benefit their health.